Compact-size PAGE system including a power supply. 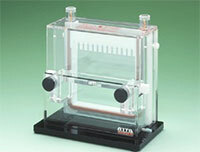 The apparatus body are very compact and easy-to-handle. Compact-size PAGE chamber separated from a power supply. 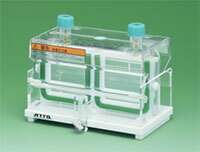 Compact Multi Gel Cast Including 2 pairs of glass plates, 2 combs, 3 divider plate, and 1 dummy plate. A mini PAGE system with a built-in power supply. High resolution separation of pro-tein and nucleic acid. High resolution separation of protein and nucleic acid. Minimized smiling with effi-cient heat dissipation. Minimized smiling with efficient heat dissipation. 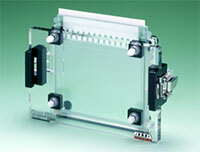 Gels can be easily prepared with a spe-cial seal gasket and clips. 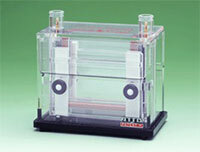 to cast two 1-mm or 0.75-mm 12-well gels. High resolution separation with simple operation. 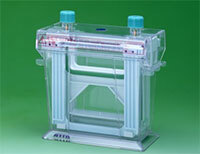 Easy gel preparation with specially de-signed parts and seal gaskets. and a comb, ready to cast a 1 or 2 mm, 12-well gel.